By moving the iconic musical Guys and Dolls slightly up north in New York, Talawa Theatre has managed to create a brand new production set in Harlem that captures the lives of New York gangsters, circling their gambling and love lives through classic musical theatre. Director Michael Buffong has maintained the central storyline of Sky Masterson and Sarah Brown’s budding romance which is spurred on by Nathan Detroit, who bet Sky that he couldn’t get any girl he wished on a date to Havana. When Nathan chooses the head of Broadway’s Save-a-Soul Mission Sarah Brown, Sky relishes the challenge but ends up falling head-over-heels for her. Taking us through the story of a group of Gangsters who are constantly looking for places to hold their illegal floating craps game, which involves betting on dice, Nathan Detroit leads the gang all whilst trying to keep his fiance of fourteen years Adelaide happy. Adelaide feels as if she has been waiting forever to get married and is sick of Nathan’s illegal activity. Although it is a musical that lacks female representation, I really enjoyed Abiona Omonua’s portrayal of Sarah Brown. As the leader of a Christian group, she is frequently played with naivety and prudishness but Omonua gives her a feisty stubbornness with a hint of sass which really gives the role some oomph. Desperate to impress her, Ashley Zhangazha takes on the role of Sky Masterson who attempts to keep his cool when pleading Sarah for a date. Zhangazha is suave and charming as he uses his charisma to score his date. The set is simple and uses a rotating stage to keep the action alive. 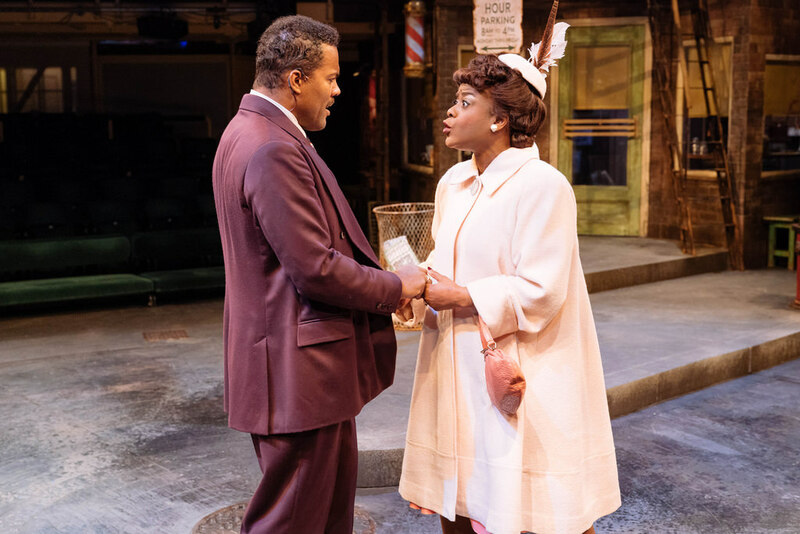 With costumes bursting with colour, it’s visually vibrant, but I found my eye constantly caught on Ray Fearon who gives a spectacular performance as Nathan Detroit. He uses impressive wit with his slick dialogue that has the audience howling with laughter. We get to see two sides of his character, the cool leader of the gang who doesn’t take no for an answer and the sweet approach he has to his fiancé Adelaide. He moves naturally and his stage presence is powerful as he drives the story along. Lucy Vandi gives a tremendous performance as his fiancé Adelaide who is losing patience with Nathan, she performs this with superb comedy timing and highly characterised musical numbers. Frank Loesser’s gorgeous score has been magnificently orchestrated by Simon Hale who captures the jazzy tones of New York into the already timeless numbers. The show is crafted well, the pace just needs picking up. There are some pockets of real high-energy, such as the ensemble number Sit Down You’re Rocking The Boat which is pumped with power, if this energy was maintained throughout it would feel a lot more engaging. That said, the choreography by Kenrick ‘H20’ Sandy MBE is incredible and brings a hip-hop vibe to the production, making it feel contemporary, fluid and fresh. Guys and Dolls at the Royal Exchange is an innovative re-imagining of a classic musical that has some superb highlights and flawless choreography. On until the 3rd of February, tickets and information can be found here.